We’d love your help. 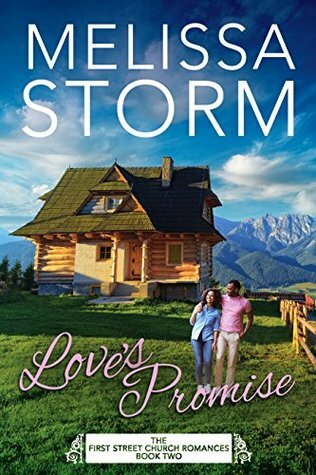 Let us know what’s wrong with this preview of Love's Promise by Melissa Storm. This special pre-order price of 99 cents is available for a limited time only! Kristina Rose Maher wants to know why fairytales never happen for fat girls. Certain that diner cook Jeff, handsome and fit, will never want her as more than a friend, she stuffs down her attraction to him. But wh This special pre-order price of 99 cents is available for a limited time only! To ask other readers questions about Love's Promise, please sign up. I know this is part of a series, but can it be read as a standalone? First Street Church Romances: Kindle World too! Melissa Storm has done it again with the second book in the First Street Church Romances series. Love's Promise focuses on Kristina, a woman who has lived with weight problems all her life and, due to this, suffers from low self-esteem. Then along comes Jeffrey, the cook where she works and their friendship slowly turns to something deeper and more meaningful. Melissa Storm has such a way of story-telling that it just leaves you wanting more and more. Looking forward to reading the next book in Melissa Storm has done it again with the second book in the First Street Church Romances series. Wow! LOVE'S PROMISE is a beautiful love story that comes true. Melissa Storm must knows firsthand how it feels to be overweight because she has written it perfectly and poignantly. This terrific read will have you laughing, crying and hoping that Kristina Rose and Jeffrey realize their friendship is the lasting foundation for their love. This is a great book, I highly recommend! Very sweet but not always interesting story. The plot was simple with twists along the way. I couldn't feel any emotion but I slogged through. What a refreshing lovely story by Ms. Storm. She has a way of writing that makes you feel warm, fuzzy and content. Don't miss out on another fantastic read. LOVE’S PROMISE is the second in the First Street Church series. Each stands on their own, but with heavy involvement with the characters from the other stories. I strongly recommend reading them all and in the order of release. So often, the world just seems to be so hard. These stories are always the perfect softening balm to my heart. This may be my favorite of the First Street Church romances that I have read so far, including those brought into this world from other authors. The theme of learn LOVE’S PROMISE is the second in the First Street Church series. Each stands on their own, but with heavy involvement with the characters from the other stories. I strongly recommend reading them all and in the order of release. The theme of learning to love yourself before you can truly love someone else is one that many struggle with in their own lives. It is beautifully and sensitively brought to life as Kristina Rose goes through gastric bypass surgery. Jeffrey, God bless him, is patient and kind. He’s a sweetheart of a man and I was rooting for him the whole way through! I am looking forward to returning to Sweet Grove, TX for another uplifting, warm, and fuzzy relationship. Note: While I received this book as a gifted ARC, my opinions are my own and are given freely. A powerful story that many of us may relate too, loving yourself and your body as others see us. This is book two of the First Street Church Romances series where we get to spend some time with a group of friends finding their way in life and with God in the town of Sweet Grove. I received an ARC copy of this book to which I have voluntary and honestly reviewed. I have enjoyed all the books I have read in this series so far. Kristina Rose Maher has always battled with her weight and now a health A powerful story that many of us may relate too, loving yourself and your body as others see us. This is book two of the First Street Church Romances series where we get to spend some time with a group of friends finding their way in life and with God in the town of Sweet Grove. I received an ARC copy of this book to which I have voluntary and honestly reviewed. I have enjoyed all the books I have read in this series so far. Kristina Rose Maher has always battled with her weight and now a health issue is making her do what she has not been doing for years, putting herself first. Kristina Rose will need to take life slowly and depend on the help of her friends to get through this change in her life that she hopes will give her the body she always dreamed of. She had always hidden behind her bubbly personality to hide her dress size. Jeffrey Berkley has always thought Kristina Rose was perfect as a friend and a co-worker. It is not until there is the possibility of her not being there every day that makes Jeffrey realise he may just feel something more. Jeffrey has also been hiding something from his family and possibly to himself. Can either one take to step out of friendship to something more and take the risk of losing the friendship totally? Can they both get the dream they both want? I enjoyed this book& was especially interested in the gastric bypass surgery angle. The book didn’t wow me as much as book 1 in the series, however the plot was easy to follow, the characters well drawn and both progressed at a good speed. Whilst expecting a happy ending, and enjoying the Christian content the only slight twist was the reaction of Jeff’s Dad when confronted about his son’s decision. Everything was pleasant and fairly predictable. The turmoil expected with each confrontation I enjoyed this book& was especially interested in the gastric bypass surgery angle. The turmoil expected with each confrontation didn’t happen, I would have expected at least one to have fully exploded and turned the relationship sour for a period! I guess as a night time read I couldn’t ask for better, nobody would get nightmares from reading it! A pleasant easy read with some good basic teaching on loving yourself and others. Taken as a whole each of the main characters developed in some aspect of this, so perhaps my score of 3 is a little low , but I’m unable to get the half star rating on this device! First, I need to thank Melissa Storm for providing me with this book so I may bring you this review! 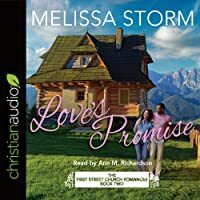 Love’s Promise by Melissa Storm is the second book in The First Street Church Romance series. This book is not a standalone and must be read in order. Reason being you will be lost in the storyline and the characters. I am a huge Melissa Storm fan but none of her books have touched me more than Kristina Rose’s story has. Even though this was Melissa’s story about her own journey written through Kri First, I need to thank Melissa Storm for providing me with this book so I may bring you this review! I am a huge Melissa Storm fan but none of her books have touched me more than Kristina Rose’s story has. Even though this was Melissa’s story about her own journey written through Kristina Rose it reminded me of mine. Even in the back of the book Melissa is so brave to not only share her journey but her before and after pictures. I commend her for sharing her story with the world. Nobody has ever written a novel quite like this before. This is why I love her writing so much. She writes from the heart and about subjects we as readers can all relate to. Even if you didn’t have this surgery there were aspects of the story you could relate to! Jeffrey was one of my ultimate favorite characters in the book besides Kristina Rose of course. He was incredibly sweet, thoughtful, supportive, resourceful, patient, didn’t judge a book by it’s cover but saw the beauty within, helpful, concerned, caring, and an amazing friend to Kristina. This character blew me away. Any girl would be so blessed to be with a man like him. As for Kristina’s Mom well she got on my nerves. I could understand her trigger for eating. Many times I wanted to go into the book and tell her Mom a few things! Especially when she brought up pizza and wings when she knew that was not on her diet nor would her pouch let her have it! I am looking forward to the next book to see where Kristina Rose’s journey takes her with the new chapter in her life. Knowing Melissa will keep it true to her experiences. Love's Promise is another wonderful book by Melissa Storm. She is a terrific author and you need to read all of her books. Love's Promise is a sweet romance and so much more. It deals with the struggle to love one's self in spite of the flaws and imperfections. Of being true to who you are and not letting others expectations/opinions determine how you live your life. Of the importance of faith in yourself. Kristina Rose and Jeffrey are wonderful characters. People who, if they are in your life, ar Love's Promise is another wonderful book by Melissa Storm. She is a terrific author and you need to read all of her books. Kristina Rose and Jeffrey are wonderful characters. People who, if they are in your life, are a blessing. They are so deserving of a happy life and an HEA. I would love to see Mabel find romance in a future book. It was nice to catch up with the characters from Love's Prayer. While the characters from Book 1 are involved in Book 2, each book is a complete novel with no cliffhanger. Do you know the moment that you find a book that you've been looking for your whole life? Melissa wrote the story beautifully and it has been an amazing journey with Jeffrey and Kristina. It gives me hope and love that something good is going to happen one day and that love sees inner beauty. Jeff is a remarkable guy. Not only he cooks, but also thoughtful. He finally managed to face his fears and that helps him to be closer to his family and God. Sometimes the path that we chose is not only the pa Do you know the moment that you find a book that you've been looking for your whole life? Jeff is a remarkable guy. Not only he cooks, but also thoughtful. He finally managed to face his fears and that helps him to be closer to his family and God. Sometimes the path that we chose is not only the path that our parents set for us but more on that what God will lead us to. People often hides behind their mask when they are busy and helping many people. It's not saying that helping is bad but we hide too much. Kristina finally learns to accept help from her friends and they all learn a lot from it. This is a new series for me ( haven't read book 1 yet) but I will be going back to read that one as well. This is a sweet romance which was a change from what I normally read. It was a nice change to have something a bit more realistic. It's nice to see real life type situations brought out and handled beautifully. Seeing Kristina's struggles about her self esteem really hit home. It was nice to see people working together to give her support and prove to her that she is worth all the love she f This is a new series for me ( haven't read book 1 yet) but I will be going back to read that one as well. This is a sweet romance which was a change from what I normally read. It was a nice change to have something a bit more realistic. It's nice to see real life type situations brought out and handled beautifully. Seeing Kristina's struggles about her self esteem really hit home. It was nice to see people working together to give her support and prove to her that she is worth all the love she feared she didn't deserve. Great story line, nice characters that I was able to fall into like with ( wasn't able to become come emotionally attached to the characters to fall in love with them), good descriptions to detail. All in all a good read. This was a really sweet story. I wanted to love it as much as I did the first one, but it just didn’t move me in the same way. In fact, there were parts of it that left me feeling faintly uncomfortable. Probably because it strikes at some of my own insecurities. Jeffrey is everything that is sweet and lovable. He’s probably my favorite character in the series so far. Even though I can find parallels to so many of her struggles in my own life, I just couldn’t connect all the way with Kristina Ros This was a really sweet story. I wanted to love it as much as I did the first one, but it just didn’t move me in the same way. In fact, there were parts of it that left me feeling faintly uncomfortable. Probably because it strikes at some of my own insecurities. Jeffrey is everything that is sweet and lovable. He’s probably my favorite character in the series so far. Even though I can find parallels to so many of her struggles in my own life, I just couldn’t connect all the way with Kristina Rose. That meant that I didn’t connect completely with the story either. It’s well written with some wonderful fun moments, it just wasn’t quite the right book for me. Love if fickle and it will hit you when you least expect it too. So come along for the ride in this sweet romantic story. This is book 2 and can be read as a stand alone. All the characters do tie in together if you want to read in order. A woman lost in thought of how to turn her life around and fine the one thing to make her happy. A man who is tired of his life being dictated by his family, he just wants to be happy and enjoy life. Kristina Rose has to have surgery to cure her diabetes and also making her slimmer in the process. But her therapist and doctor both told her that she must figure out what is causing her anxiety which is fueling her to eat and eat. But the question is what is missing in her life and causing her anxiety? Could it be just under her nose? I loved this story more than the first one in this series. Kristina Rose has health issues and has to go through gastric bypass surgery. All her friends rally around her to support her. Her co-worker Jeffrey realizes that he has been in love with her all along. They both have family problems.Her mother isn't supportive of her and Jeff's father wants him to go to school to take over the families pharmacy. It is really interesting how they come together. It was a great story of finding faith and s I loved this story more than the first one in this series. Kristina Rose has health issues and has to go through gastric bypass surgery. All her friends rally around her to support her. Her co-worker Jeffrey realizes that he has been in love with her all along. They both have family problems.Her mother isn't supportive of her and Jeff's father wants him to go to school to take over the families pharmacy. It is really interesting how they come together. It was a great story of finding faith and supporting one another.I like how at the end of Ms. Storm's book lead into the next one. When you can see pieces of yourself within a story, you know that you've found something special. Ms. Storm spoke from the heart with Love's Promise. Kristin and Jeffrey could be any of us. The wounds run deep and the insecurities are at times hard to bear, but the message of hope and solidarity adds to the power and integrity of an uplifting journey. We all need a little help, that voice of encouragement to inspire us to push through and never give up. Love's Promise is that voice. A beautiful story of an overweight girl Kristina and Jeff her good friend and coworker. It is about letting faith drive out fear to open yourself up to love. The two main characters have feelings for each other but Kristina needs to work through her weight loss surgery and Jeff needs to figure things out about his future. When and how will they find the time to show their feelings to each other? I was given a copy of this book by the author with no obligation. I am glad I found Melissa Storm and read this book. My journey was like hers but over a period 40 plus years and over 100 pounds. I have done the yo-yo, dieting, the exercise losing 50lbs so many times I lost count. The weight is still there, the low self-esteem but no more yo-yo diets. I need to learn to lean on God and let him take over. This story gives me hope that it is even possible at 70. Thank you, Melissa, for writing the book that I hope will change my life. Wonderful story! This is one of the original 4 books that began the popular series. This is a sweet and clean romance with strong faith elements. I can see why Amazon chose this as one of their Kindle Worlds. I have other of this author’s works and this is the high quality that I have come to expect from her. I received a free copy of this book and voluntarily chose to share my honest review. I voluntarily read and reviewed a copy of Love’s Promise from the author. This is the second book in the First Street Church Romances series and in this book we get to see Kristina Rose Maher and Jeffrey Berkley. This was such an easy book to get lost in and it was such a beautiful story that captivated you. I look forward to reading more by this author. Another great addition to the First Street Church series. Ms. Storm deals with the emotional issue of life before and after gastric bypass surgery. She displays the feelings of the one suffering and also of the friends that surround her extremely well. Sweet romance and a wonderful read. I recommend this entire series highly. Melissa Storm does it again! Love’s Promise is captivating and challenging to put down. I love the way each character faces reality and truth. How the goodness, kindness and truly caring for one another reminds one what life is truly about! Thank you, Melissa and I can’t wait to start Book 3 “Love’s Prophet”! A very good book about a problem a lot of people have and how it can impact their lives and the way they look at themselves. I found it to be a tastefully written book that drew me into the book and would not let go until I had read the last page.I received a copy of this book and am voluntarily choosing to review it. Melissa loves books so much, she married fellow author Falcon Storm. Between the two of them, there are always plenty of imaginative, awe-inspiring stories to share. Melissa and Falcon also run the business Novel Publicity together, where she works as publisher, marketer, editor, and all-around business mogul. When she's not reading, writing, or child-rearing, Melissa spends time relaxing at home in the company of her two dogs, five parrots, and rescue cat. She never misses an episode of The Bachelor or her nightly lavender-infused soak in the tub. Learn more about Melissa's business at www.NovelPublicity.com. Learn more about her other author alias at www.EmlynChand.com. Learn more about her life on Facebook, Pinterest, Twitter, or Google+. Got a question? Send her a message here.